Baseball in St. Joseph has seen many famous Hall of Fame players such as Dizzy Dean, Satchel Paige, Yogi Berra, Stan Musial, Mickey Mantle, and Earl Weaver. Fans in St. Joseph were able to witness their magnificent presence in our 77-year-old city stadium, now known as Phil Welch Stadium. 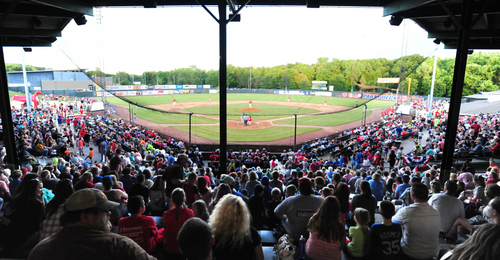 Phil Welch Stadium has also experienced many changes, from ball teams to events, over the past 70-plus years. The city of St. Joseph had secured its share of dollars of matching federal funding with an earlier bond issue that also paid for the construction of several fire stations, and a new police station. Phil Welch, the Mayor of St. Joseph, from 1936-1946, and later a congressman, led that victorious effort. The stadium was built in 1939 as a WPA project at a cost of more then $100,000 and dedicated to the Mayor of St. Joseph, Phil Welch, in 1964. Lehr Construction Co. of St. Joseph was the general contractor for the stadium. The reported capacity was 4,277. The stadium had been built in just 10 weeks, but was not ready for opening day. Opening day was played at Thames Stadium because of the delay. Construction began on April 15 and with all but a few details had been completed in time for opening day on June 23,1939 for the dedication. More than 3,500 fans were on hand for the first game as the St. Joseph Saints lost to the Muskogee Reds, with the score of 12-11. Opening Day for the St. Joseph Saints marked the official observance of Class C Western Association’s 100th anniversary of baseball, with league officials and other dignitaries on hand for the occasion. Before the era of free agency for baseball players, postseason “barnstorming” tours were organized. Teams of Major Leaguers, playing under the name of their best-known star, would travel from coast to coast, playing against each other, or playing against local teams. This was a time when there were only 16 Major League teams, all east of St. Louis, and no games broadcast on television. This was the only opportunity for most Americans to see Major League all-stars, pitch an inning or two, step up to the plate and swing the bat or catch a fly ball, and then retire until the next night’s game in another city. Dizzy Dean did have an appearance in St. Joseph where he pitched in 1930, when the stadium was located on 27th and Messanie. Satchel Paige appeared at Phil Welch Stadium when the Kansas City Monarchs played a game annually at the ballpark. He also was here with his traveling all-stars. As a high school player in 1943, Yogi Berra was the player to hit a home run over the 420 foot wall in center field. He was playing for the Stockham Post in St. Louis in an American Legion State Tournament. Stan Musial, playing for the Springfield Cardinals, had 10 hits in a four-game series in May 1941, as his team swept the Saints. He would later go on to Rochester in the AA International League, and then to the parent St. Louis Cardinals before the 1941 season was over. Mickey Mantle was in St. Joe as a member of the 1950 Joplin Miners. At that time he was a dazzlingly quick, hard-hitting, wild-throwing shortstop. When he arrived in the Major Leagues for the New York Yankees, the club concluded he would be better placed in the outfield. Weaver, the Hall of Fame Manager for the Baltimore Orioles played 2nd base for the 1949 St. Joseph Cardinals. He hit .282 and had the second-best fielding average among the league’s second baseman. Contrary to some published reports, Weaver was not married at home plate at Phil Welch Stadium. He did get married that season in St. Joseph, but it was at the First English Lutheran Church, (now First Lutheran). He played that night and had three hits. The stadium was home to the Saints for the 1939-1940 seasons, and the first few weeks of 1941. The Saints had a working agreement with the St. Louis Browns during the 1941 season. The third year of the St. Joseph Saints showed a drop in attendance. A Memorial Day doubleheader against the Yankees' farm club in Joplin drew 334 paid fans. Due to low attendance, the 1941 season ended abruptly for the St. Joseph Saints in early June, when the league moved the franchise to Carthage, MO. The team finished in 6th place in an eight team league with a record of 10-22. Professional baseball returned to St. Joseph in 1946, when the Cardinals switched their Western Association farm club from Springfield, MO to St. Joseph. 1947 and 1948 were banner years for Minor League baseball in St. Joe. The team drew over 125,000 fans for the 70 home games each year. The St. Joseph Cardinals didn’t have enough players to stock a team in 1952, so the stadium sat idle for a while. A working agreement was developed with St. Louis in 1953, when the Yankees and Cardinals switched farm clubs in 1954 and the stadium became home, once again, to the St. Joseph Saints. When the Major League Baseball team, the Athletics, came to Kansas City in 1955, it was the end of professional baseball in St. Joseph for half a century. The field was used for American Legion games, National Softball Championships, with a temporary fence installed in the outfield, rodeos, and even wrestling matches. In the early 1990s came the era of Lonnie Weaver and his St. Joseph Cardinals, the formal designation of the stadium in honor of Phil Welch, the collegiate St. Joseph Saints and then the short-lived Independent League St. Joseph Blacksnakes. In 2009, the St. Joseph Mustangs took the field as a summer collegiate baseball team in the MINK League. The Mustangs have been in contention for a league championship during each year since they were established, and claimed MINK League Titles in 2011, 2012, 2014 and 2015. The Mustangs' President and CEO Dan Gerson teamed up with the city of St. Joseph to bring major changes to Phil Welch Stadium, including shorter fences and a Party Deck in right field which adds more seating for fans. Attendance for the wildly popular Mustangs has increased nearly every season. Under the team's original general manager, Rick Muntean, St. Joseph won its first two MINK championships, and average attendance climbed above 2,000 fans per game. In the 2014 off-season, Muntean accepted a position with an independent baseball team in Ohio, and promotions director Ky Turner was elevated to general manager. Under Turner's direction, the Mustangs' have consistently ranked in the top 10 among all summer collegiate baseball teams in the United States drawing nearly 2,400 fans per game, and 3,500 for weekend contests. The product on the field for the Mustangs has also matched the team's success off of it. Matt Johnson's managed the club each season since its inception in 2009. During those years, Johnson's won four MINK League titles, earned two fourth place finishes at the NBC World Series, and has two additional top 10 finishes in the NBC. Overall, the Sawyer, ND native has posted a 284-142 record (a .667 win percentage) through his first eight seasons with St. Joseph.